This tutorial should explain the main concept of an interface. After creating the integration user need to come to this step and create an interface. 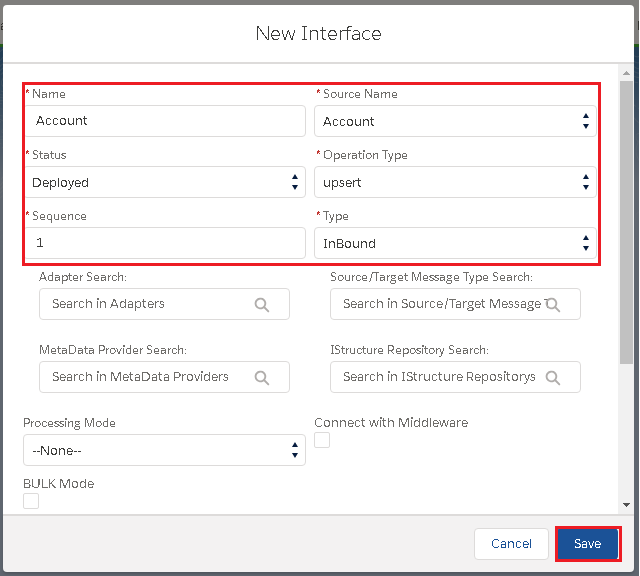 The configuration of an interface is complex we cannot explain all the parameter on the interface screen in detail in this tutorial. Instead just create an example interface like Account and set only the basic parameter. This interface should be tested using manual load. There are 3 different categories of interface technology we support: Synchronous and real-time (synchronous) batch (asynchronous) bulk (asynchronous) When the interface is run messages will be created. For more detail what message monitoring is and how to use it tell user to read the other tutorial about “Message Monitoring”. Interface is the second main object in SKYVVA after the integration. Interface describes the structure of data to exchange between Salesforce and other application. Next property of interface is define the processing mode. e.g. Synchronous and real-time (synchronous) Batch (asynchronous) and Bulk (asynchronous). You have installed Skyvva in your salesforce organisation. Upsert: To update on existed data and insert new data that isn’t existed yet in Message Monitoring. Update: Only update on data that is already existed in Message Monitoring. Insert: Add all data in the Message Monitoring. Outbound: Export data outside SalesforceNote: Upsert is usually used since it can update on the existed data and add new data into Message Monitoring then Save. Batch Mode has been used when there are big amount data you would like to upload. It is bigger than Synchronous and real-time. Bulk Mode has been used when there are mass amount of data you would like to upload. It is larger than Batch mode. CDC can provide an ability to record all data changes you create on any business object. It will be automatically push to your external system at any time you scheduled. When you checkbox this flag it’s mean that you activate CDC. This flag is used to activate both CDC and CDD “Use SKYVVA Outbound Scheduler”. Setup a date from when you define the changed data to be collected in Agent/CDD Scheduler LastRun.